AMONG the 12 pillars of competitiveness applied by the World Economic Forum (WEF) in determining competitiveness of a country is its institutional environment. This is determined by the legal and administrative framework within which individuals, firms and government interact to generate income and wealth in the economy. The recent global economic crisis has certainly demonstrated the need for an effective framework in preventing systemic market failures which brought detrimental consequences to economies around the globe. While market participants continue to be inclined towards efficient allocation of resources and wealth creation, total reliance on the wisdom of these players had proven to be significantly risky to the society. Interestingly, the latest global competitiveness report issued by WEF mentions the relevance of accounting and reporting standards and transparency for preventing fraud and mismanagement, ensuring good governance, and maintaining investor and consumer confidence. It also states that an economy will be well served by businesses that are run honestly, where managers abide by strong ethical practices in their dealings with the government, other firms and the public. The report also emphasises that private-sector transparency is indispensable to business, and can be brought about through the use of standards as well as auditing and accounting practices that ensure access to information in a timely manner. In the Global Competitiveness Report 2009-2010, the strength of auditing and reporting standards in Malaysia is ranked 43rd out of the 133 economies covered. The ethical behaviour of firms and efficacy of corporate boards are ranked 44th and 25th respectively. For Malaysia to be more competitive, these areas need to be improved as they relate directly with investor confidence. The accountancy sector is well placed to be the key contributor in the enhancement of governance and ensuring quality information is made available to stakeholders both for the capital market as well as the small and medium enterprises sectors. In addition to this, accountants play critical roles in supporting the value creation process of organisations by being involved at the strategic level, leading strategy implementation, ensuring good financial management as well as putting in place good managerial practices in organisations. In moving forward the accountancy sector, strategic decisions need to be made and appropriate actions against those who fail to uphold professional standards would certainly be expected by the society. As in any other case, timely decision-making and actions are important elements. The Malaysian Institute of Accountants (MIA) was established under the Accountants Act in 1967. As it is, MIA plays both the role as regulator and provider of services to those who are registered with MIA. Originally, all members of the Council were elected in the annual general meeting. An amendment to the Accountants Act in 2000 enables the Minister of Finance to appoint two-thirds of the MIA Council members. While this arrangement generally works, conflicts arise when MIA initiates policies and actions which are deemed unpopular to certain segment of its membership, particularly accountants who are in public practice. This had in the past delayed critical decisions as well as diluted the effectiveness of MIA’s actions. Some of the challenges faced by this institution in performing its role in ensuring the interest of Malaysians is protected are the results of certain elements of the Accountants Act. For example only members of MIA Council could be involved in running the disciplinary process. This has created bottlenecks, especially in investigation cases referred to MIA. 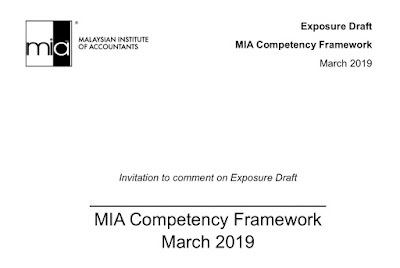 Changes to the rules which govern the relationship between MIA and its members need members' approval at a general meeting before they could be gazetted by the government. Such a requirement is simply burdensome and could face resistance, especially involving changes that impose additional expectations on its membership. Just imagine what would happen if the approval from lorry drivers is required before the Road Transport Department could enforce any rules regarding road safety? The time has come for an overall institutional reform on how the accountancy sector is governed. The dual roles of MIA as regulator and service provider may no longer be effective given hard and decisive actions are frequently needed in the present business environment. Perhaps a more independent Accountancy Development Board could be considered. This board would be given the responsibility of shaping policy, setting standards, developing the industry as well as enforcing disciplinary actions. MIA could be transformed into a member-based organisation, dedicated to providing services to its membership. Singapore has certainly taken this path very much earlier. The Public Accountant Oversight Board which was established under the Singapore Accountants Act is an example that we could consider. Perhaps in our case, instead of just focusing on public accountants, the Accountancy Development Board should also be involved in enhancing the value creation role of accountants as well as reinforcing the integrity of the financial reporting chain. Moving up the economic value chain and enhancement of our competitiveness level require the necessary supporting infrastructures to be brought into action. The Accountancy Development Board is certainly an idea which warrants serious consideration. More regulation in store for auditors? Could boards do a better job in risk oversight?